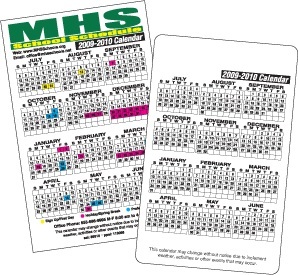 4-color process digitally printed school calendar schedule magnets printed on a white, flexible magnetic material. This material is intended for indoor usage only. Material thickness is approximately .019". 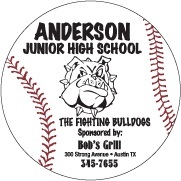 Many styles and sizes to choose from to promote any sports event schedule or other school or event schedule. Build your custom calendar any way you like! We can also print on .036" magnet thickness if outdoor use is needed. Contact us for pricing. Production Time: Approximately 5-7 working days after proof approval. An additional $20 non-refundable artwork layout charge must be paid before work can begin on all orders with approved digital artwork. A $48 non-refundable artwork layout charge applies for non-digital artwork on first order only. 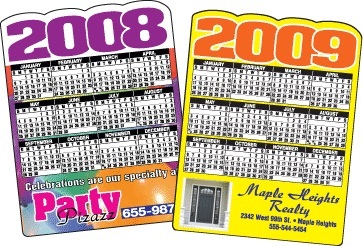 RECESSION SPECIAL - Place your order by the end of the month, and get 5% off Schedule Magnets based on the above prices. Buy another item from us of $250 or more, and get an additional 5% off Schedule Magnets. Art Preparation: Select any of our digital backgrounds shown below at no additional charge. Stock mascots available. Add one of the mascots shown below at no extra charge. 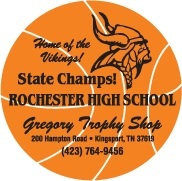 To order custom school schedule magnets, e-mail us at tencommandmentsigns@yahoo.com or call us at 706-374-0710. Pay your artwork fee by credit card to start work today. Pick one of the above designs and the size. We can adjust the art work to any size. We can even use your full color art, but prices may change slightly.